How Is a Person's Last Will & Testament Legally Read? After a person dies, all of that person's property must be gathered, cataloged and distributed to surviving heirs. This process is called probate, and it involves a state court judge who reads the will and orders compliance with the will. The deceased person's executor is the person who actually carries out the administrative task of dealing with the property and other assets. Ideally, before you die, you will name somebody you trust to act as your executor. You will name this person in your will, and with any luck, that person will be aware that they are your executor. That way, when you die, the executor immediately takes over and begins taking care of your property. The executor will obtain a copy of your will and submit to the local state court for the "probate" process. What Are the Requirements That Mandate Probating an Estate? Probate is a court process where the executor basically runs the show under the supervision and guidance of a probate judge. The judge will review the will submitted by the personal executor, and if there are any ambiguous portions of the will, the judge will clarify those portions for the executor. The executor has the right to ask the judge to help resolve any difficult issues that may arise in the probate process. Sometimes, a court simply reads a will and the executor merely fills out the paperwork necessary to comply with the will. Other times, people fight over whether a will is valid, whether portions of a will are valid, and anything else you can think of. In technical legal terms, this is referred to as a will contest. Children who were not included in a will, for example, commonly file a will contest in hopes of having the will declared invalid. That way, the forgotten or cut-off heir will still recover some inheritance under state law that applies when there is no valid will. Depending on whether any potential heirs file a will contest, the probate process can be fairly quick and painless, or it can be a long, expensive hassle. The executor will fight to enforce the will, and in the end, the probate judge will sign a court order either declaring the will valid or invalid. If the will is valid, the executor will then take over and comply with the terms of the will. A will is basically an instruction manual for the executor. It tells the executor who to pay, how much to pay and with what money to pay. The executor will first pay off the deceased's outstanding debts, and then will distribute the remaining money and property according to the deceased's instructions. This process includes drafting property deeds, bills of sale and simply giving physical possession to heirs. At this point, it is simply the executor reading and applying the will. M., Phil. 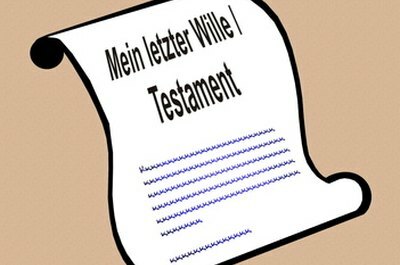 "How Is a Person's Last Will & Testament Legally Read?" , https://legalbeagle.com/6680696-persons-last-testament-legally-read.html. Accessed 20 April 2019.